I cook a pot-roasted tarragon chicken as soon as I feel the first warmth of spring. But in the heat of summer I switch to this, which is delicious with warm new potatoes. Several hours in advance – or the day before – put the chicken in a casserole; cover with water; bring to the boil; reduce the heat and remove any surface scum. Add the onion, celery, carrot, bay leaf, tarragon sprigs and peppercorns. Whisk the yolks with a little salt in a bowl and add some oil drop by drop, until the mixture starts to emulsify. Then add each oil gently, in a stream, beating constantly. When it starts to become very thick, add a little lemon juice and continue until all the oil has gone in. Thin the mayonnaise with 4 tbsp cooking liquid (freeze the rest for stock). Stir in the tarragon; season. Slice the chicken and put on a plate; pour on the sauce. Chill for at least 3 hours. 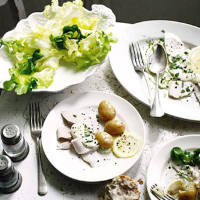 Decorate with lemon slices and the extra tarragon. 2007/08 Limoux, South of France. Bin 95060; £7.99.